The nation's economy is in trouble, but there's one cash crop that has the potential to turn it around: cannabis (also known as marijuana and hemp). According to "Time," the legal medicinal cannabis economy already generates $200 million annually in taxable proceeds from a mere two hundred thousand registered medical users in just fourteen states. ABC News reports that underground cannabis's $35.8 billion annual revenues already exceed the combined value of corn ($23.3 billion) and wheat ($7.5 billion). Considering the economic impact of Prohibition and its repeal "Too High to Fail" isn t a commune-dweller's utopian rant, it's an objectively (if humorously) reported account of how one plant can drastically change the shape of our country, culturally, politically, and economically. 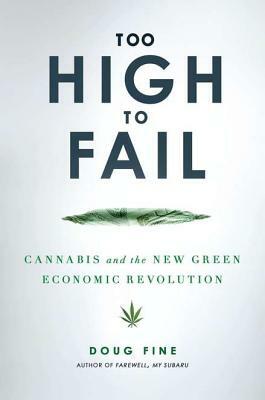 "Too High to Fail" covers everything from a brief history of hemp to an insider's perspective on a growing season in Mendocino County, where cannabis drives 80 percent of the economy (to the tune of $6 billion annually). Investigative journalist Doug Fine follows one plant from seed to patient in the first American county to fully legalize and regulate cannabis farming. He profiles an issue of critical importance to lawmakers, media pundits, and ordinary Americans whether or not they inhale. It's a wild ride that includes swooping helicopters, college tuitions paid with cash, cannabis-friendly sheriffs, and never-before-gained access to the world of the emerging legitimate, taxpaying ganjaprenneur. Doug Fine is the author of two previous books, "Not Really an Alaskan Mountain Man "and" Farewell, My Subaru "(a "Boston Globe" bestseller). He has reported for "The Washington Post," "Wired," "Salon," "High Times," "Outside," NPR, and "U.S. News & World Report." He currently lives in New Mexico, where he relocated his family to research this book.